Sen. Elizabeth Warren (D-MA) questions John Stumpf, chairman and CEO of the Wells Fargo & Company, during a hearing of the Senate Banking, Housing and Urban Affairs Committee September 20, 2016 in Washington, DC. 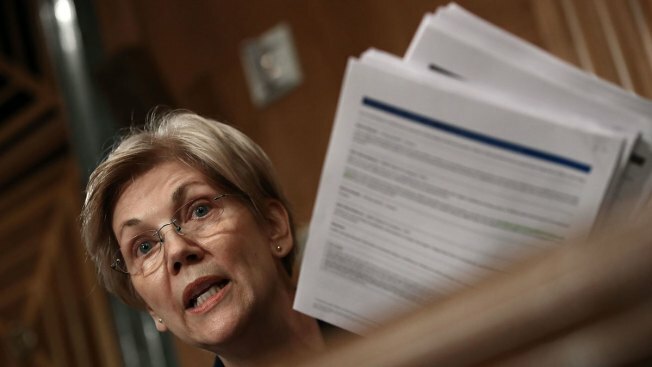 U.S. Sen. Elizabeth Warren pulled no punches Tuesday as the CEO of Wells Fargo was questioned on Capitol Hill for his part in the bank's opening of millions of phony accounts without customers' permission. "You should resign," she told Wells Fargo CEO John Stumpf. "You should give back the money you took while this scam was going on and you should be criminally investigated by both the Department of Justice and the Securities and Exchange Commission." Others on the panel spoke of the "toxic culture" pervasive at Wells Fargo, and accused the bank of not acting fast enough to fix its illegal practices. The disgraced CEO offered a personal apology for his part in the sham accounts debacle. "I am deeply sorry that we failed to fulfill our responsibility to our customers, to our team members, and to the American public," he said.